The Duo-Fast Sureshot 5020 Air and EWB 5018 Electric Wide Crown Staplers are available. Call us for pricing and availability. The Sureshot 5020 Air Stapler replaces the AWC 5018 Stapler and drives the same staple. 5000 staples per box. 20 boxes per case. 1/2" width staples. 10000 staples per box. 20 boxes per case. 3/8" width staples. 5000 staples per box. 20 boxes per case. For use with Empire, Rainco, TC-08 model staplers. 10,000 per box. 20 boxes per case. 3/8" Wide. 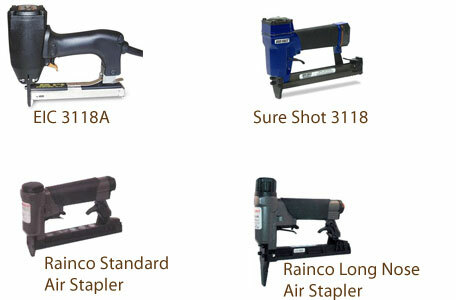 Daily use is recommended to condition seals and insure proper function of air staplers. Use two drops where hose attachs to stapler.